I’m proof that it can be done. I quilted this queen-size quilt on my home machine. I don’t have one of those machines with an enormous harp and still I was able to get the job done. Along the way, I learned a few things. Big quilts are heavy. Take the strain off your back, arms, and wrists by setting up enough support for the quilt. This support needs to be to the left of your machine. I don’t have a big sewing cabinet, just a regular desk that I call a sewing table. So, to get the support I needed for the quilt, I improvised. I placed a card table to my left and pushed it up against my sewing table so that I had a surface for the bulk of the quilt to rest on while I quilted. I also placed a long folding table behind my sewing machine to support the quilt as it came through the machine. 2. Position yourself and your machine. Getting your machine and your body in the right position is key to reducing fatigue and preventing aches and pains. Check out this video for things to consider about your setup. I ended up needing to put a couple of pillows on my chair to raise my body to the right height. I was amazed at the difference it made in my comfort level. 3. Roll and clip it. Before inserting the quilt in the machine, roll the section that needs to go through the harp. And then clip it at the fullest areas. I use these clips. I find that clipping takes the pressure off my hands and wrists and helps the quilt more easily glide through the harp. It’s like having two extra hands to hold the quilt! Check out this photo of the quilt with the clips attached. Notice the amount of space in the harp. 4. If stuck, guide from the back of the machine. There were times I was working on the center of the quilt and found that the roll under the harp was like a big, fat sausage stuck in my machine. My instinct was to try to push it through as I sewed. I discovered that trying to push the quilt through the harp takes a lot of effort and didn’t get me very far. But when I tried guiding the quilt from the back of the machine, it moved through the harp with more ease. If your quilt gets stuck, take hold of it from the back of the machine and gently guide it through as you sew. 5. Work from the center out. Start quilting from the center and move toward the right. You’ll work first with most of the quilt rolled up at the right. As you quilt and work toward the right, there will be less of the quilt under the harp, which will make the quilting much easier. 6. Work those straight lines. I personally think that working with big quilts on the home machine is more manageable when quilting straight lines. Check out my tutorial on straight line quilting. For info specific to free motion quilting big quilts on home machines, check out Oh Fransson’s tips. 7. Take lots of breaks. At times I have to remind myself that quilting is not a marathon that must be completed in one sitting. Big quilts take time – lots of it. So give yourself a break every 30 minutes or so. Get up. Stretch. Walk around. Get something to drink or eat and then get back at it. I hope these tips inspire you try quilting a big quilt on your home machine. If you have any questions, please let me know in the comments section. Feel free to share any of your own tips in the comments section as well. Just what I needed! I have a quilt sandwich languishing in the basement because I am a little scared to tackle it, but you have given me some hope!! Thanks for sharing, Nicole – good advice! You did a fabulous job Nicole!! The quilt is quite stunning; with that dark binding…love it! Good advice. Great advice. I have never seen those clips, but now I want some! Great advice about straight lines for quilting a large quilt. I've done a twin with meandering and wouldn't go larger than that for that design. I think I've read somewhere to just concentrate on making the 6 inches under your throat space that you are working on the best you can. Was it hard doing straight diagonal lines as the fabric grain is on the bias? Great tips Nicole. I wonder if those clips are available anywhere in NZ. Obrigada por compartilhar,você é mesmo maravilhosa.Vou sair a cata dessas arpas,que além de úteis são lindas,adorei!Eu também uso mesa de apoio,só que a minha era uma mesa velha redonda,troquei o tampo e aproveitei o pé que é pesado,tive a ideia de fazer igual essas modernas que roda só o meio,só que rodando inteira e mais larga.É só na hora da volta ficar em pé e ajeitar a peça que vai muito bem.Tem só uma semana que estou usando e estou rendendo bem.Um grande beijo e fique com DEUS Sra.TALENTO. Thanks so much for the tips. I am trying to learn to quilt on my home machine and really struggling. I keep getting bird nests on my bobbin side when I try to do the stippling. I do ok with the straight lines. Helpful tips! I will definitely be coming back here if I ever get the nerve to quilt at home again! Thanks for the tips Nicole! Especially the one about taking breaks. Nicole, you've inspired me to dive into the quilting lines on my daughters twin size Granny Square Quilt. I've been hesitating because it's the biggest one I've ever attempted on my home machine. Thanks for the great tips!! Great tips, Nicole 🙂 I always roll mine up like that, but I really need to get some of those clips! What a great idea! Thanks for the good tips. I have quilt tops that I haven't quilted because I don't want to pay for a long arm quilter to do it, I haven't been so sure how to do it on my home machine. So Thanks! great tips – the ergonomic post is really good. Thank you Nicole? I am going to look for those clips — that's a great tip! Great tips Nicole. I need to watch that ergonomics video! The picture of the quilt and you on the floor is breathtaking! That needs to be used for greeting cards. That is a wonderful use of positioning. Thank you thank you thank you!! I've been struggling with a queen size quilt & my Brother ES-2000 (not a good quilting machine!) Am trying your tips out now. Loved the video about Ergonomic quilting, had to make a few adjustments there. Really Great tips! Can't wait to try it on my next quilt! Thanks for your tips! I've had success quilting crib quilts at home, but I've always paid someone to quilt anything bigger. I'm definitely going to quilt my own from now on! Found this post doing a search for reviews on the "quilting big projects on a small machine" craftsy course. Reading your post as well as others, I think maybe I don't need to spend $40 on the craftsy course after all. Love your quilts and your quilting. I just found your blog, and I am loving it. I just found your bloggie. Just love your quilts, creativity and your advice. Both of my daughters, Christina and Lizzie are married now! O_O I know, how did that happen? Well, and it did in 18 months and two big weddings. Well. They married good Christian men, good smart guys. We are blessed. I will enjoy getting updates and encouragement from your ideas and expertise. I am a longtime sewist, just new to quilting. 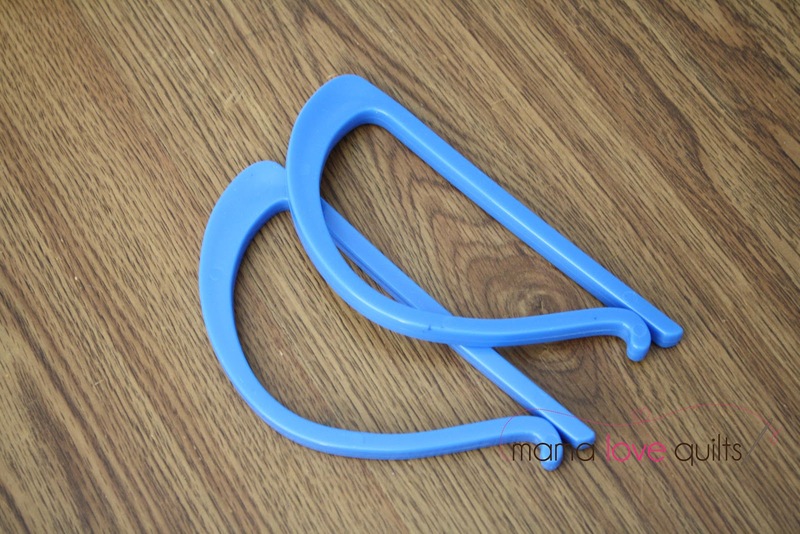 Great tip about the clips…I'll look for them! Thanks! I’ve just come across this post and it has helped so much! I am currently in the middle of making my first quilt and suddenly panicked when I saw the size of my quilt compared to my machine. I am off to buy those clips right now. There’s nothing worse than being so enthusiastic about a craft project and spending so much time on it to suddenly worry it won’t work. Yay! I’m so glad the post was helpful. Let me know if you have any questions. You can do it! Go for it Caroline! I’ve found clips to be very helpful. Good luck with that king-sized quilt!